Bell became a professional swimmer by age 14. 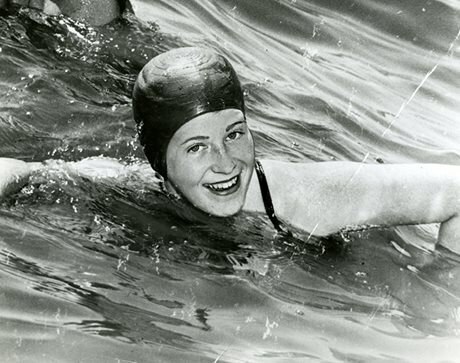 In September 1954, 16-year-old Marilyn Bell became the first person to swim across Lake Ontario. Originally, the Lake Ontario swim had been planned by the Canadian National Exhibition (CNE) as a publicity event that offered American marathon swimmer Florence Chadwick $10,000 to cross the lake. As a Canadian who was not invited to participate, Bell decided to volunteer for the swim. She entered the cool waters at Youngstown, New York at 11:07 p.m. on September 8. When people heard on the radio that the young Bell was the only one left in the choppy waters, they began to gather at the CNE grandstand overlooking the lake. After swimming for 20 hours and 59 minutes and covering nearly 40 miles (64 kilometres), Bell touched the breakwall in Toronto at 8:06 p.m. the following evening. She became an instant sports celebrity and was idolized in the community. Listen to an interview with Bell from the CBC Digital Archives on September 9, 1954, following her swim across Lake Ontario. Visit Canada’s Sport Hall of Fame website, The Bobbie Rosenfeld and Lionel Conacher Award Winners page. Watch Bell on The Lou Marsh Legacy website as she talks about her swim and its impact.